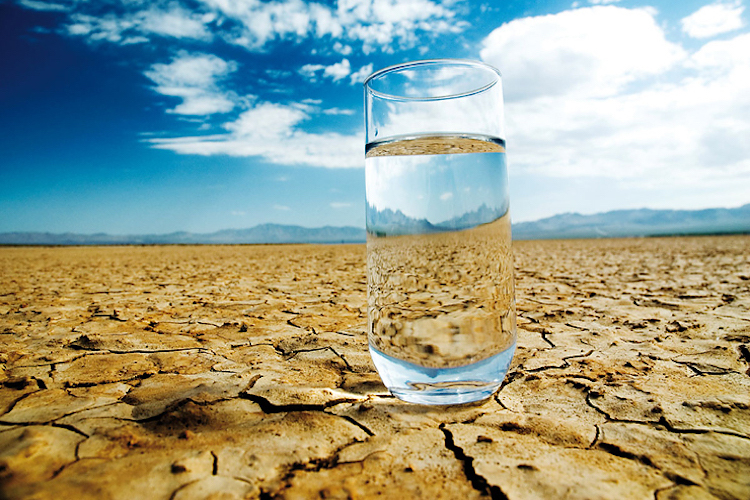 As we get older, the symptoms of dehydration may be less recognizable. 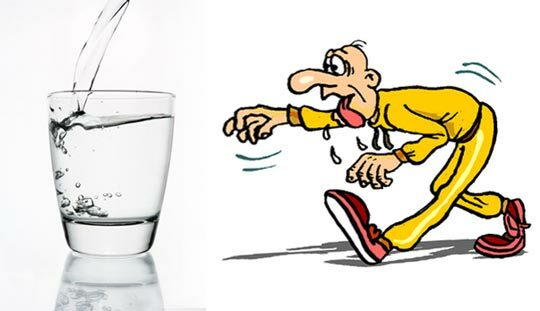 Being able to recognize dehydration as we get older becomes more important because it subtly affects so many bodily functions yet we get weaker indications that hydration is the problem. When you’re dehydrated, your body secretes less fluid. You already know that means decreased urination, but it’s also true for tears and saliva. Saliva is antibacterial, so if you’re not producing enough, it can lead to bacteria overgrowth in your mouth. That means bad breath. It’s also why so many of us experience morning breath, as saliva flow almost stops completely while we sleep. If you suddenly have dragon breath for no apparent reason, try drinking more water regularly. That alone may clear it up. Dehydration can mask itself as hunger, especially in the form of sugar cravings. When you’re low on fluid, your body uses glycogen (carbohydrate stored in muscle) at a faster rate, thus reducing your energy stores more rapidly. This is particularly common if you’ve been exercising. Your body will likely crave carbs to help replenish those glycogen stores. Before you reach for the sweets, drink some water. You might find it satisfies your craving. When you’re approaching severe dehydration, your body starts to limit blood flow to the skin, says Bruce Bushwick, M.D., a family physician and chair of the department of family medicine at Wellspan York Hospital. “We call it ‘shunting’ your blood from your skin to your internal organs,” he says. Your body is doing what it can to conserve whatever fluid is left—even stealing water from Peter to pay Paul. The skin is the first place to be robbed of water. Reduced blood flow to the skin can also make it feel more doughlike and less elastic, Dr. Bushwick says. If you pinch the skin on the back of your hand and it doesn’t snap back as quickly as usual, it might mean you’re dehydrated. Just don’t expect your skin to rebound as quickly as it did in your twenties. Less water circulating in the body means less blood, too. This can lead to lower blood pressure and cause you to feel lightheaded, faint, or dizzy. One of the key signs of dehydration-related dizziness is a sudden rush of lightheadedness when you stand up too quickly, a condition called orthostatic hypotension. 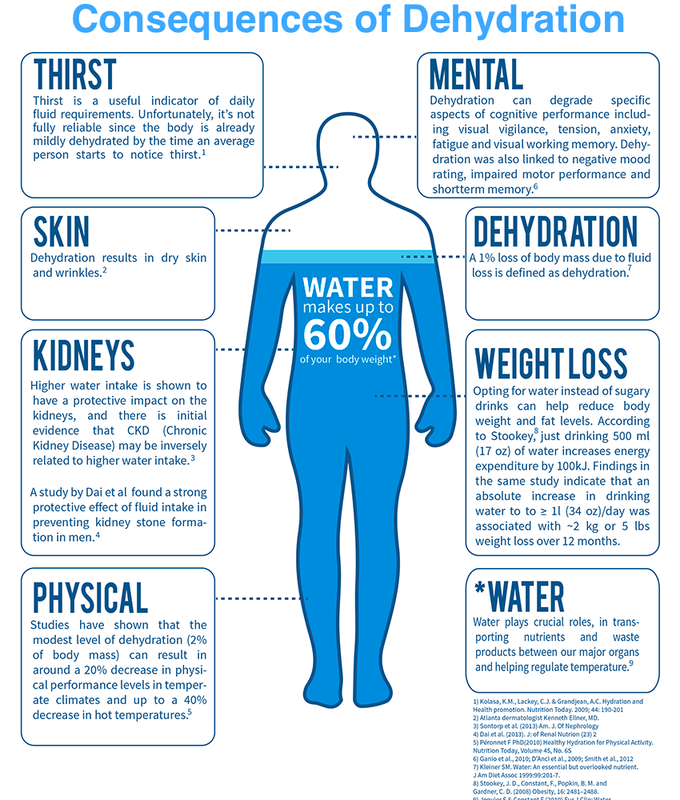 Drinking plenty of fluids helps reduce these symptoms in most cases. But if a person is dehydrated to the point of mental confusion—or have experienced vomiting or diarrhea—it warrants immediate medical attention. Keep a water bottle with you everywhere and take small sips frequently. Check for the 5 signs above frequently. Drink 8 oz of water with each meal. Refrain from using sugary “soft drinks” or juices to hydrate – don’t increase your sugar intake in the name of hydration.